Suddenly the entire island shook convulsively. The movement lasted only fifteen seconds; but when it was over a sweet, peaceful scene of human happiness and industry had been transformed into one of agony and ruin. 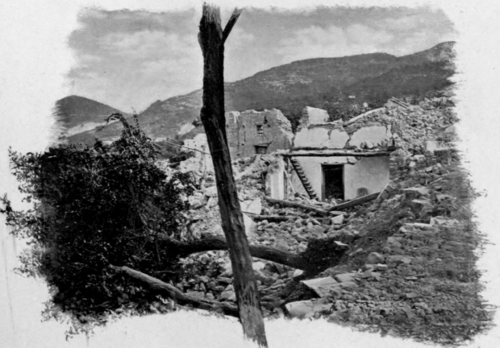 The walls and roof of La Piccola Sentinella had fallen like a house of cards, burying all the company in the debris. The "Funeral March" had ushered in a carnival of death. Soft happy voices either had been stilled forever, or were now heard in shrieks of anguish; the pure air, laden with the perfume of flowers and the breath of the sea, was choked with stifling clouds of dust; and, here and there, streams of burning oil from overturned lamps ran like the tongues of devils through the entangled timbers and threatened the imprisoned victims with the worst of deaths. When the drawing-room of the hotel was subsequently excavated, the dead pianist was found still seated before the crushed piano, and a girl who had just sung to his accompaniment lay dead beside him. 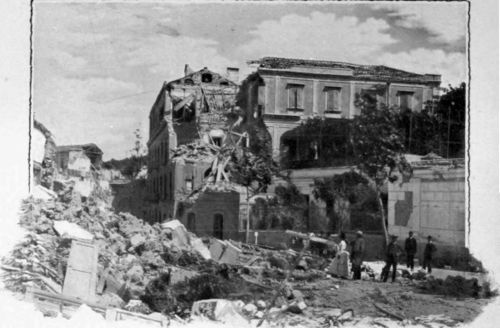 Not a house in Casamicciola was left standing; and its streets and lovely gardens were filled with shattered buildings, pianos, statues, pictures, and household furniture heaped up in broken fragments, and forming a horrible chaos. 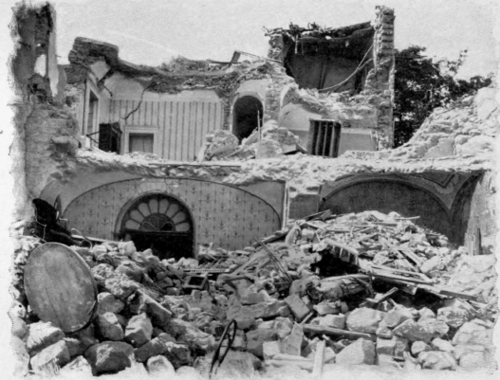 Drawing-Room Of La Piccola, After The Earthquake. Buildings were tossed about, as if their walls had possessed no more strength than paper screens. In all, more than two thousand persons either perished on the spot, or subsequently starved to death in situations from which they could not be extricated. The night that followed was one of the most terrible recorded in even the appalling history of the Bay of Naples. Groping in darkness, the horrified survivors crawled over the debris, while the groans of the dying, the shrieks of the suffering, and the appeals of the terror-stricken came up to them through the crevices from the living tombs below. When the morning dawned, soldiers had arrived to work among the ruins, and steamers brought out to the island, every hour, cargoes of food, beds, medicine, and coffins. 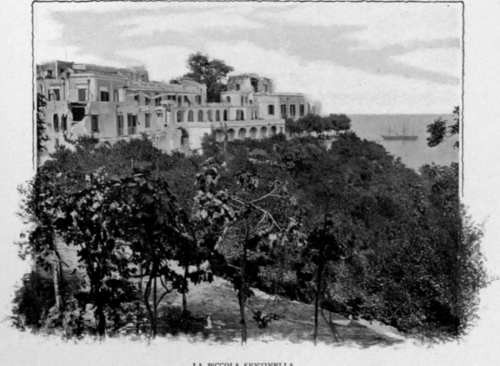 But half of the population of Casamicciola was either dead or buried alive. Sometimes a hand was seen emerging piteously from a mass of stories, as if the wrist were held in a vice. What was below it no one dared to think. Meantime, the lamentations and delirious excitement of the rescued, whose husbands, wives, children, or sweethearts were heard moaning faintly or imploring help, can be imagined; especially when one considers the emotional nature of the Neapolitans. It is said that King Humbert, who went at once to the scene of the disaster, exclaimed, as the tears rolled down his face, "My God! I never dreamed of such misery as this". 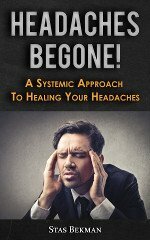 Think, indeed, of the horror of regaining consciousness, to find yourself held down by beams or masonry, a portion of your body crushed, bruised, or broken, and some one very dear to you lying dead beside you; or, still worse, suffering and calling for help beyond your reach! There were some won-derful instances of preservation and rescue. Two ladies, for example, found themselves lying under an iron girder which had fallen in such a way as just to protect them from a mass of masonry ten feet thick. They were imprisoned thus for sixty-seven hours, but were finally saved unharmed. An American lady was found with her feet crushed, while a huge beam hung trembling above her, like the sword of Damocles; but, although released from her terrible position, she lived only eight days. The most prominent feature of the island of Ischia is Monte Epomeo, a mountain rising twenty-six hundred feet above the sea. It is a volcano which, until Vesuvius resumed activity in the early part of the Christian era, appeared to be the safety-valve for the volcanic agencies at work around the Bay of Naples; but as it has not poured out any lava since 1302, scientists consider it now to be extinct and harmless. 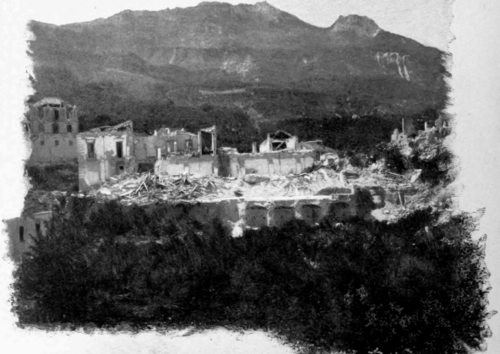 Still, when one thinks that the destruction of Pompeii was occasioned by a mountain also supposed to be entirely tranquil, he is unable to feel perfectly secure at Ischia.